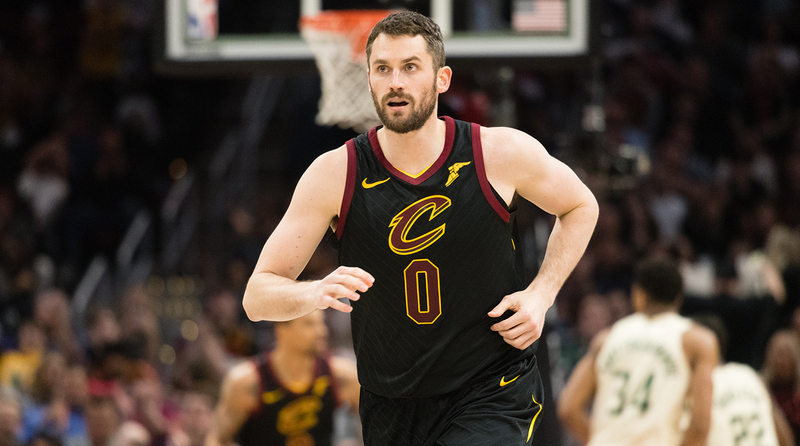 With LeBron James leaving Cleveland for L.A., the Cavaliers extended their committment to Kevin Love with a lucrative contract but is it a smart move? The Crossover graded the deal. In an unexpected twist, Kevin Love and the Cleveland Cavaliers moved Tuesday to prolong their relationship, as the veteran forward signed a reported four-year, $120 million contract extension. Love, who turns 30 in September, committed to the Cavs through 2023. The team scheduled a ceremony at Quicken Loans Arena to allow employees and arena workers to be present as Love signed. While that decision made for a nice moment on social media, Cleveland’s choice to secure Love at a massive salary number deserves skepticism. Without a doubt, the Cavs face an unenviable organizational challenge in moving on from the second LeBron James era both internally, externally and on the floor. The primary thing they had going for them long-term, going into the off-season with an understanding that James could leave, was flexibility. None of the Cavs’ key players were under contract past 2019-20, offering a potentially clean slate with which to eventually rebuild after years of living in the luxury tax. Cleveland chose Collin Sexton with the No. 8 selection in this year’s draft, putting a young, score-first ball-handler in place. Assigning a massive chunk of that future cap space to Love, who is nearly 10 years older, suggests both disinterest in a full teardown, but also a misunderstanding of situational factors that appear set to trap the Cavs in competitive limbo. From a pure basketball standpoint, you can understand why the team wanted to pay up. It’s difficult to convince top NBA talent to pack up and move to Cleveland, and even tougher without being able to sell free agents on playing alongside LeBron. Love is a consummate pro and likable face of the team who can help bridge the gap toward whatever it is that comes next. But while he’s been admirably consistent as a rebounder and three-point threat and worked himself into incredible shape in this stage of his career, he does little to protect the rim and remains a defensive vulnerability. Love also no longer has the advantage of playing alongside a generational scorer and playmaker in James. Though Love once averaged 26 and 13 as a solo act in Minnesota, expecting him to return to that level of production as he moves toward the back end of his prime is foolhardy. He has been unfairly scapegoated at times, but the Cavs will have to figure out how to ensure Love’s production contributes to winning games. The Eastern Conference is thin in the middle, and there’s room to return to the playoffs, but turning over the keys to a rookie point guard and asking more of George Hill, J.R. Smith and Tristan Thompson doesn’t inspire confidence. They’re reportedly interested in giving a new deal to Larry Nance, and Rodney Hood is still a restricted free agent. Considering all the factors, the Cavs are most likely bound for the middle of the pack, despite a clear incentive and opportunity to bottom out for a season or two. Unless their 2019 first-round draft pick falls in the Top 10, it will convey to the Hawks as part of a 2017 trade for Kyle Korver (and if the Cavs keep it, the Hawks will have another chance to get the pick in 2020). Sexton can score the ball but isn’t much of a playmaker, and will have growing pains over the next few seasons. Cedi Osman will finally get a chance to play this season, and they took a chance on Billy Preston with a two-way deal. Beyond that, Cleveland’s roster is barren of young talent. Going into this season, Love was also a trade chip that could have helped the Cavs net young talent or draft picks to help them reorient the team. It helps that he took less than the maximum, but the long-term money still shoots his trade value in the foot for the immediate future, with many teams preserving future cap room to bid on star players next summer. Stepping back, it’s hard to shake the feeling that paying big to keep Love was a Dan Gilbert-driven decision, as are many big things in Cleveland, focused more on keeping the team relevant amid a two-year arena renovation project than truly building with an eye toward contention down the road. Admittedly, it’s much easier to suggest a franchise tanks than to actually stomach it, but the roster as it stands is going nowhere fast and needs to be turned over. Signing Love may keep the Cavs afloat for now, but does little to accelerate that process. He certainly deserved to get paid, but Cleveland didn’t need to be the team footing the bill. What's Behind the Lakers' Bizarre Offseason?